Haken’s Gordian Knot and the Twisting, Overlapping, Envelope Elephant. I constantly look for Continuous Lines in many fields of art, history, mathematics – anywhere, as I just do not know where they are going to crop up. Currently I am casting an eye on Islamic Art and Celtic art and am developing ideas on those. 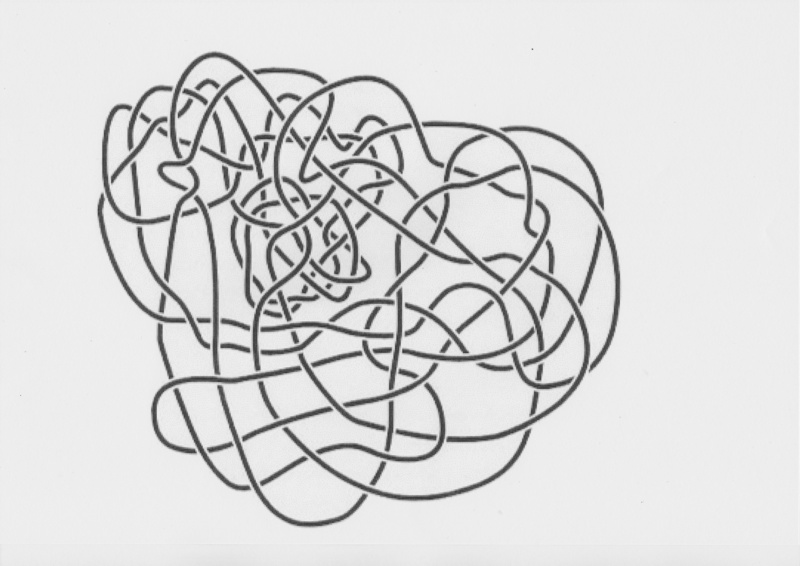 Recently I glanced through a book called “Professor Stewart’s Cabinet of Mathematical Curiosities” and came across Haken’s Gordian Knot, a really complicated looking knot which is really an unknot in disguise – a simple circle of string (ends glued together) making a closed line. Here it is. When I looked at the Knot, it reminded me of my “Twisting, Overlapping, Envelope Elephant” continuous line in that it has a lot of twists. I realised straight away that a narrow loop on the outside (left lower) seemed to lead into the structure with its two strands twisting as it went, each time in a clockwise direction. I followed the two twisting lines throughout the drawing until they ended in a loop on the outside (left higher). I wanted to draw and paint this knot. My first drawing was of the line on its own. The depth of some of the lines reminded me of one of my earliest paintings “Leeds Inner Ring Road Starts Here”, which was based upon a sign board which appeared near Miles Bookshop in 1967 informing us of the route the new road would carve through the City. This was several years before Spagetti Junction was built near Birmingham. My picture had lines swirling all over at various heights in one continuous line. 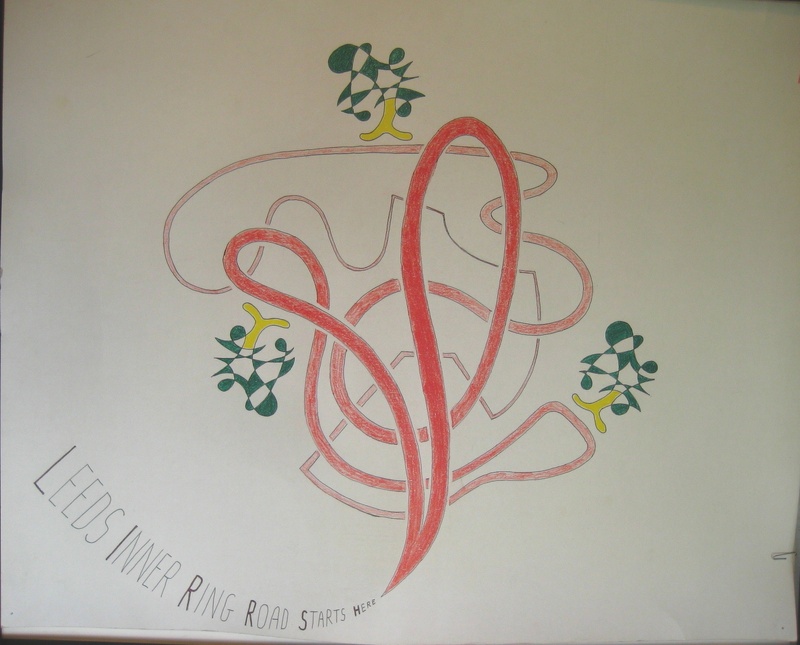 Leeds Inner Ring Road Starts Here. Use of varying thickness of single continuous line drawing, overs and unders. Pre dates Spagetty Junction near Birmingham. Mick Burton, 1967. 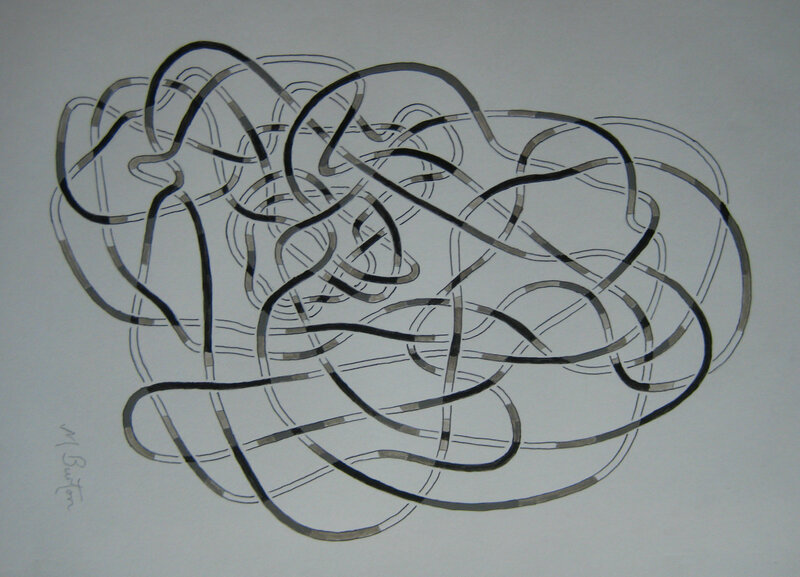 My first picture of the Gordian Knot, in black and white, concentrated on the heights of the lines following the overs and unders shown by Haken. Depth of lines in black and white, in Haken’s Gordian Knot. Mick Burton, single continuous line drawing. 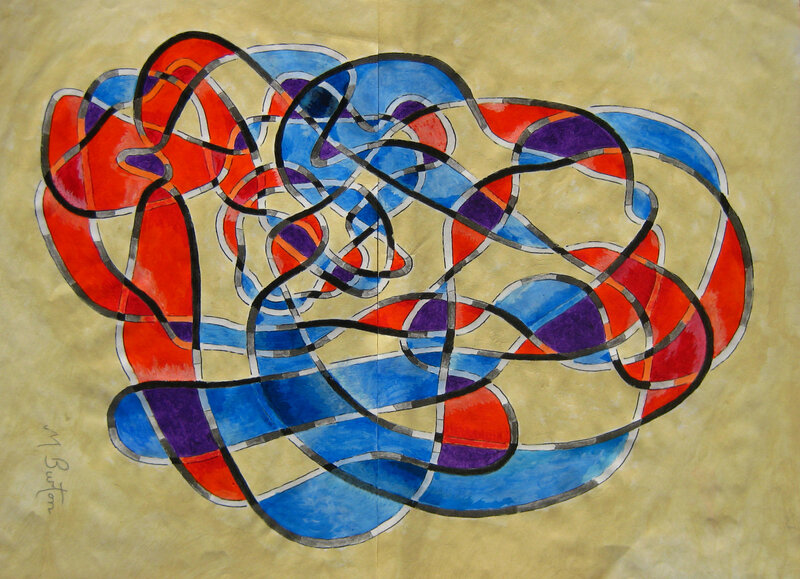 But my main aim now was to use blue and red to show the twisting nature of the pair of lines running between the starting loop and the end loop. This was intended to allow the viewer to more easily follow the loop and the twists throughout the structure. Twisting, overlapping colouring of Haken’s Gordian Knot. Mick Burton single continuous line drawing. 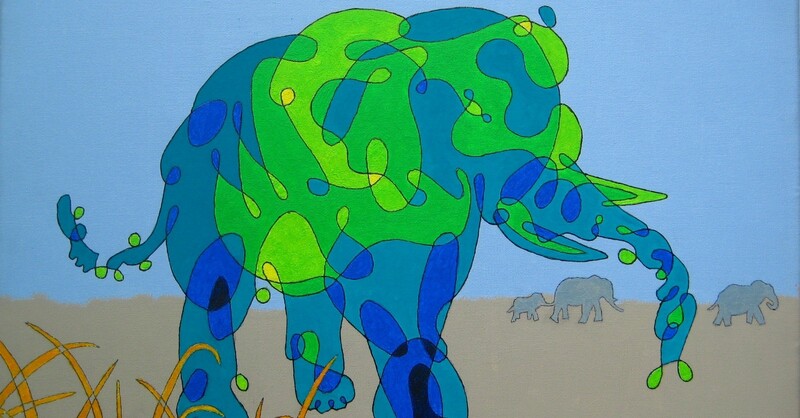 Just like viewing my “Twisting, Overlapping, Envelope Elephant”, from my previous post, imagine that you have a strip of plastic which is blue on the front and when you twist it over it is painted red on the back. Where blues cross each other you have darker blues, and correspondingly with reds. Where blue crosses red you have violet. I show the strips feeding through each other, like ghosts through a wall. There are some darks and lights in there as well. Most usefully, the background shines through to help make the strips stand out. You can now get more of a feel for what is going on. I counted 36 clockwise twists and one anti-clockwise (number 26). Continued twists in the same direction tie in the ongoing loop, when it feeds through the two strands of its earlier route at least 12 times. Twist number 26 probably cancels out the effect of number 25. This is a preparatory painting, in acrylic but on two sheets of copy paper sellotaped together. When I exhibit these pictures they will be hung as portrait, rather than the landscape shown here for comparison with Haken (as you will note from where my signature is). I think they look a bit like the head of the Queen in portrait mode ! Having got this far, I realised that I should find out more about the Haken knot (or unknot), beyond Professor Stewart’s brief introduction. How did Haken construct the knot and why? Please see my next post, on this continuous line blog, to see how I got on. This entry was posted in Abstract, Famous Artists, My Styles of Drawing and Colouring, People Portraits and tagged Abstract, abstract continuous line, acrylic, background shines through, background uncoloured, black and white, blue and red, Celtic art, circle of string, clockwise, closed line, Continuous line drawing, crossover continuous lines, Gordian Knot, Haken, Haken's Gordian Knot, head of the queen, Leeds Inner Ring Road Starts Here, mathematical, Mick Burton, Mick Burton continuous line blog, mick burton leeds artist, Mick Burton Yorkshire artist, Queen's portrait, Spagetti Junction, starting loop, strip of plastic, Twisting Overlapping Envelope Elephant, two strands twisting on June 2, 2015 by mickburton2.